Released on Thursday, the watchOS 5.1.2 update added the ECG app to the Apple Watch Series 4. By using electrodes in the back crystal and the Digital Crown, a 30-second test can be performed, classifying the user's heart rate as atrial fibrillation (Afib,) sinus rhythm, or inconclusive. A Reddit user identified as "edentel" wrote a post about their dealings with the Apple Watch Series 4 after running the update. Warned of an abnormal heart rate in notifications, the user tried out the ECG app and was provided the Afib result. Initially the user believed there was a glitch with the firmware, after repeated tests came up Afib, but trials with the user's wife's wrist came back with normal results. After trying the other wrist and the other side of the arm, the warnings continued to be provided when the user tried out the app in other ways. The Redditor writes they went to Patient First, expecting to just go home after potentially wasting their doctor's time. When asked what was wrong, "edentel" was embarrassed to say "Ok, so there's a new watch feature..." before asking to check its results. The comment was a "quick queue pass" for Patient First, apparently, with the user hooked up for testing. The doctor looked at the readings from the medical equipment, and suggested "You should buy Apple stock. This probably saved you." The doctor advised they had read about the ECG feature's release the previous evening, and while they thought there would be an upswing of patients reacting to the messages, the doctor "didn't expect it first thing this morning." The Reddit user has reached out to AppleInsider since original publication, and has provided sufficient evidence to prove the story true. 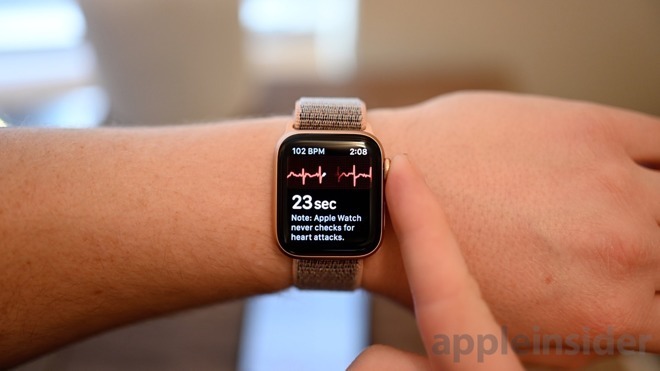 On a wider scale, it is highly likely the new ECG feature, as well as the Irregular Rhythm Notification feature available in earlier Apple Watch models, will prompt concerned users to check their health via their physician. AppleInsider has reached out to several cardiologists in the Washington D.C. Metro area to talk about the update and the ECG feature. All of the groups we spoke to have either confirmed a reading in the emergency room since release of the OS update as a result of the reading at home, or have seen patients in the office already as a result. Afib is said to be one of the leading conditions that can result in a stroke, and is the second-most common cause of death in the world. According to CDC estimates, Afib can affect up to two percent of the younger population of the United States, rising to nine percent for those aged 65 years or older. Updated to note response from Reddit user.